Director: Greg Barker. Documentary following Barack Obama and key members of his foreign policy team through the last year of his second administration. Interview subjects include Samantha Power, Ben Rhodes, John Kerry, and Barack Obama. 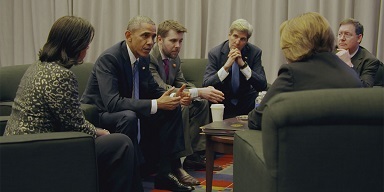 Twitter Capsule: Amazing access to Kerry, Power, Rhodes, Obama. A moving though tenaciously televisual tribute to hard, hopeful work. VOR: ③ Documentaries shouldn't be judged by levels of access, though it's remarkable here. Style is bare, editing rushed, but still a rare POV on politics.